Anthony Halstead has been a leader in the period instrument movement as horn player, harpsichordist, scholar, advisor, and conductor. He is a teacher who has influenced many professionals and is a coach of amateur hornists and other musicians. As an inventive technician, he has developed a range of mouthpieces (with Tony Chidell) and other aids to better sound production. Halstead was born in 1945 in Manchester, England, attending Chetham’s School and the Royal Manchester College of Music, where he studied piano, horn, organ, and composition. At the suggestion of his horn teacher, Sydney Coulston, Halstead specialized in horn. He was principal horn in the BBC Scottish Symphony in 1966, later a member of the London Symphony Orchestra and first horn in the English Chamber Orchestra (1973-1986). It was during his tenure with the ECO that he became interested in the natural horn. Halstead recalls a lecture-recital with Barry Tuckwell and Horace Fitzpatrick (author of The Horn and Horn Playing and the Austro-Bohemian Tradition from 1680-1830). Tuckwell played a fragment of a Mozart concerto or the Beethoven sonata on the modern horn, and then Fitzpatrick played the same passage on the natural horn. "I was utterly fascinated and charmed by the range of color," says Halstead, "as well as the appropriateness of the use of the stopped notes to either enhance a musical phrase or to bring some dramatic point to life." After leaving college, Halstead took several lessons with Horace Fitzpatrick and Myron Bloom. He also studied harpsichord with George Malcolm and conducting with Michael Rose and Sir Charles Mackerras. His first public performances on natural horn occurred in 1973: the Bach Brandenburg Concerto No. 1 and the Telemann Concerto a tré for horn and recorder. He played on a Paxman hand horn (basically a modern horn with the valves removed) with the orchestra all on modern instruments. He has since been associated with the Academy of Ancient Music, the Orchestra of the Age of Enlightenment, and especially Hanover Band, has taught at the Guildhall School of Music, and is active as a private teacher and in the British Horn Society. Halstead's work as a conductor in the period-instrument movement takes him to modern orchestras whose players, using conventional instruments, wish to develop a stylistic awareness of authentic practice in the baroque, classical, and romantic eras. He has a special empathy with the Australian Chamber Orchestra, the Netherlands Radio Chamber Orchestra, and the Uppsala Chamber Orchestra. 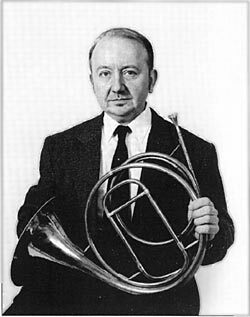 Halstead made his first solo CD in 1986, recording Weber’s Concertino on the natural horn with the Hanover Band for Nimbus. This been re-released. Halstead completed a seven-year project with the Hanover Band, recording on 22 CDs all the orchestral music of J.C. Bach and playing solo harpsichord or fortepiano in the 27 keyboard concertos, directing the orchestra from the keyboard. Other solo CDs include the Concertos of Joseph and Michael Haydn, and two separate recordings, six years apart, of the Mozart concertos, with the Hanover Band and the Academy of Ancient Music. 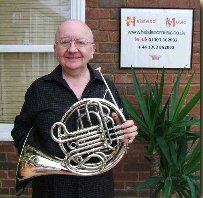 On the modern horn he has recorded the Britten Serenade with American tenor Jerry Hadley. Halstead was elected an Honorary Member at the 2010 IHS Symposium in Brisbane, Australia. He is also an Honorary Member of the British Horn Society. Paul Austin interviewed him in the February 1996 issue of The Horn Call.